My grandfather Joe, on my dad’s side, fought alongside his brothers and cousins for the US in WWII. He found himself in multiple theaters: at Normandy, in Northern Africa, in Italy. And unlike many men of that generation, he never shied away from telling us stories about the war, but he picked his tales carefully. We heard anecdotes about the lighter side of things, such as the small black goat they bought from a man on the side of the road; they named the kid Midnight and made him their company’s mascot for a while. My favorite story, though, was the one he and my grandmother, Rose, told us about how they met and married. Seeing as Valentines’ Day approaches with relentless haste and this is such a sweet tale, I want to share it with you. My grandmother isn’t alive anymore, and my grandfather is in his nineties, and now just feels like the right time to commit this story to writing. My grandfather was on a thirty-day furlough from the army and was headed home to Houston. It was the mid-1940s, and he’d had several tours in the war already. He came back stateside to the northeast and then took a long train ride down to San Antonio, where he would need stay at the base for processing for three days before continuing on home. On the train to Texas, he sat across from a man he didn’t know, but who had “the map of Lebanon on his face.” Always happy to meet any ethnic brethren, my grandfather introduced himself, and on that journey, they became friends. I don’t remember the other Lebanese man’s name, but he lived in San Antonio, and he invited my grandfather to come home with him for real food instead of staying at the base the whole time. He didn’t have to ask twice. Now, across the street from that hospitable gentleman lived the Sacres, another Lebanese family. The Sacres had six grown children, three boys and three girls; their boys had been in the war, too, and they had a kindly habit of inviting the Lebanese GIs coming through San Antonio over for dinner. When they found out their across-the-street neighbor was home and that he had a friend with him, the dinner invitation couldn’t come fast enough. The Sacre daughters — Mary, Sarah, and Rose — were all beautiful as could be, and they were polite to the soldiers at dinner. And afterward the young people all went out bowling. Over the next three days, while my grandfather was in town, they all continued to meet and go out, but it was clear that he had a particular interest in Rose. The oldest sister, Mary, told Rose she should date him. He was good-looking and from a well-heeled family in Houston. My grandmother was ambivalent, largely because when the soldiers had come for dinner that first night, my grandfather had kept staring at her. “I was admiring your dress,” he insisted when they told me this story. “You were looking at my chest,” she scolded him. “Very pretty,” my grandfather corrected her. She shrugged, but even more than fifty years later, she still blushed cheerfully about it. So in those three days, the young folks managed to see each other quite a bit. Joe told Rose he’d be back in a couple of weekends, and he hoped she’d go out with him again. “Okay,” she responded casually, but with a very nice smile. When she told her older sister Mary about it, Mary was very keen that Rose go out with him. But my grandmother could be a bit stubborn and never liked being told what to do. She acted noncommittal and advised Mary that she should go out with him instead. Well, of course that didn’t happen. Two weeks later, Joe came back to San Antonio and took Rose to a dance. He told her he wanted to marry her. I’m not sure what had changed in my grandmother’s mind in those two weeks, but she agreed. While my grandfather was on leave, the war ended, and he was discharged from the army so he could come back to Houston and make his life as a grocer. And as a husband. A couple of months later, Joe and Rose married. They went to the beach for a little honeymoon. They lived in Houston, had seven children, and — though it wasn’t any more perfect than any other marriage, and in some ways it was rockier at times — they made a pretty good life of it. My grandmother passed away from cancer in 2001, a few weeks after they celebrated their anniversary. It was a party around her sickbed. She was lucid, we all managed to be cheerful, and there were so many friends and family members around we couldn’t all fit. The cake was enormous, and my grandfather held her hand all afternoon. Last year around this time, I suggested you should write a love note to someone — anyone — for Valentines’ Day. I think this ought to be an annual tradition. Go ahead, write a love note, write a poem if you like, write a card. Do something wonderful for someone you care about. Here, Dear Readers, is a valentine for you. My daughter made this. Pretty cool, huh? 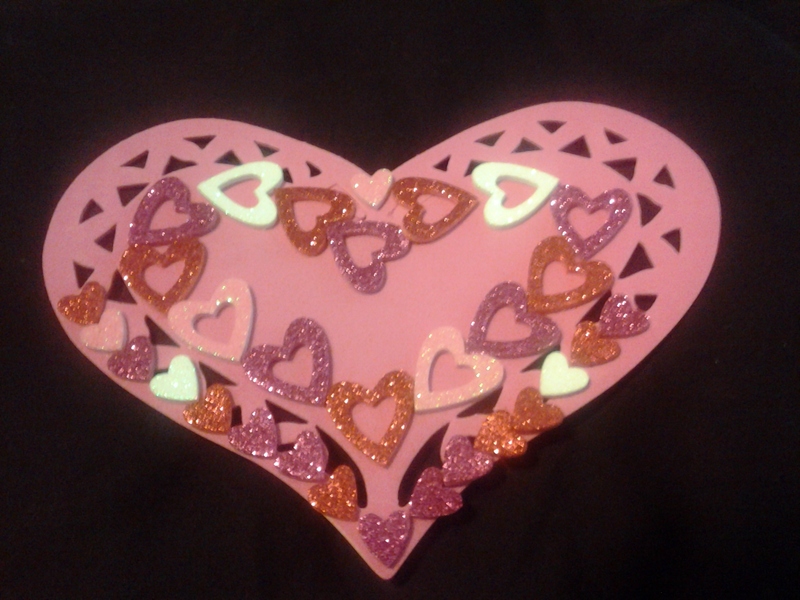 She made a different valentine for every teacher and classmate and friend. I wish I could take pictures of all of them to show you. Sweet little story. Thank you. Well, he did propose when he thought he was headed back into war. It was a different era. They told me this story shortly after we got married, I think, maybe right before or right after Tita was diagnosed with cancer. Probably a little before, now that I think about it. Were you living in Houston at the time? We were at Mom and Dad’s house for dinner. On the 14th of February 2012, in response to a request to write poetry about love, though not from a conventional viewpoint, I posted my first poem under the title ‘Love’ on my blog. Since then I have posted a total of 81. I am planning what will perhaps be the last one in this series for posting on 14th February 2013. It will be written with someone I love very much in mind. That’s awesome! 🙂 I’d like to undertake something with that kind of discipline. I managed to do the NaNoWriMo (well, after a fashion, in my own way) and 30 Days of Gratitude at the same time without screwing up, so maybe I’ll give something like those another go. It was an unintentional endeavour – I never expected it to grow as large as 80+. Everyone, check that link out. Her poetry is really lovely and smart.